new song: “agave blues”, and time for…. chili! A new song posted this week: “Agave Blues” from the forthcoming album, “Another Day in Paradox” in 2013 (it’s right around the corner). “Agave…” is kind of surf-y, kind of blues-y, kind of hip-hop, and kind of electronic. This is the home-mastered demo version – as always, the final album version will sound slightly different. In a 6-quart pot, combine the petite diced tomatoes and Hatch green chilis in 5 oz. of water over medium heat. Add 1/3 cup Chile Rojo, 1 tbsp. of minced garlic and bring to a boil. Turn down the heat and add the 75 oz. of black beans – if you’re using canned black beans, that’s 5 cans and 2 of those can be the jalapeno and lime juice black beans (Kuner’s). Stir occasionally and cover and simmer. Meanwhile, in a good-sized skillet, brown the 3 lbs. of ground beef (usually 91% lean) in 1/2 oz. of roasted red pepper olive oil – you can substitute 3 lbs. of beef tenderloin for a more “upscale” chili. Season with 2 tbsp. Cumin seed, 4 tbsp. of Chili powder, and 1 tbsp. of minced garlic as it cooks. Then add about 6 oz. of red wine – I usually use the Rex-Goliath Free Range Red or a Malbec or Cabernet for more earthiness (plus you’ll just want to have it around to partake of while you’re slaving away at the stove). Finish cooking until oil and wine have been cooked off. When the beef is done, add it to the pot of chili and stir well. Slowly pour 6 oz. of beer into the pot while stirring – for this batch I used New Belgium’s Abbey Ale, but you can try it with a stout (Guinness) or a hefeweizen (Breckenridge Brewery’s Agave Wheat, sticking with the whole ‘agave’ theme here…. I don’t recommend using an IPA). Cover and simmer for about another 2 1/2 hours, stirring occasionally. Finishing touches: crumble up the tortilla rounds and put them in the bowl, chop up the red onion, that goes on top of the chili with the grated cheddar/monterey jack marbled cheese and away you go… enjoy! Serves about 8-12. 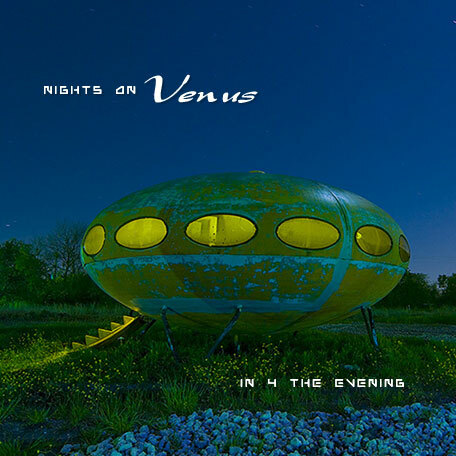 “In 4 the Evening” is the second and current album from Nights on Venus and is available as a digital download on CDBaby, iTunes, Amazon.mp3, Bandcamp and other fine online retailers. On CD through the NoV website. Follow Craig and NoV on Twitter (@xlntsky) and Facebook. Author nightsonvenusPosted on November 30, 2012 November 30, 2012 Categories general, music, uncategorizedTags Agave Blues, Another Day in Paradox, chili recipes, Colorado, Craig C Thomas, Denver, Ether rock, Indie music, music, new music, Nights on Venus, NoV, Post-rock, red chili, ReverbNationLeave a comment on new song: “agave blues”, and time for…. chili!